Illustration: Andrea Vail. Gained (LOST) Opportunity, 2010. The work of artist Andrea Vail is dedicated to, and uses a number of formats, disciplines and traditional crafts. Common themes run through her varied work which are as significant and fundamental as the history of our species. Memory, the layers of time and the significance of objects imbued with personality and a fundamental symbolism are an integral part of her work and guide us through a variety of everyday and abstract ideas, which in turn give us perhaps a sense of our belonging within the timeframe of the environment and that of our species. Although Vail's work covers a number of themes and ideas, it is perhaps as well to pick out one of those themes, to follow a strand of thought in some ways. A good example would be that of the simple key. A key in its own right is merely a tool made of metal in order to lock and unlock a mechanism. However, this simple but iconic tool has gradually become imbued with our shared psyche. It is part of our history as a species, but perhaps more importantly it is also part of our significantly individual history as well. 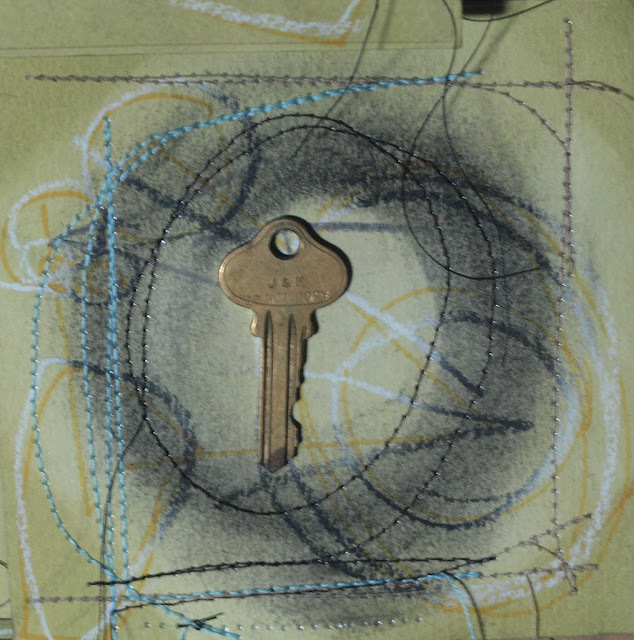 A key is a form of memory, shared experience and in time that of layered reminders of that experience. In some respects, it matters little as to the individual experiences that are attached to a key. All first-hand memories eventually fade, become confused or just become subsumed in the mass of human experience. 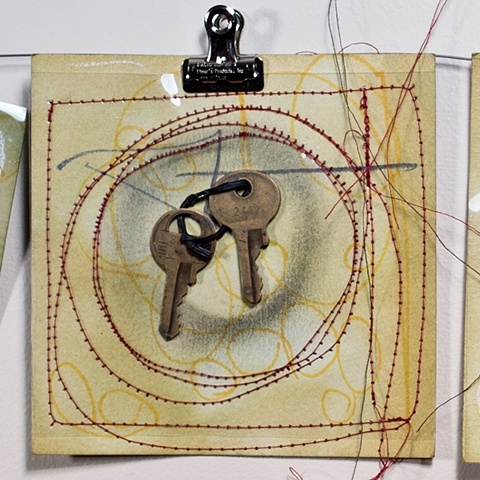 However, the very real experience of creating a collection of random or lost keys is also an exercise in the symbolic. We all understand that a key can often be of a symbol of a deeply personal nature. We all have, and carry through our lives a number of different keys for a number of different reasons. Giving a key to someone can be a validation of trust in someone, a rite of passage as in that given to an adolescent, or the potential cementing of a relationship. On the other hand a key can also be a reluctant relinquishment of power or even a complete surrender of independence, as in old age. We are all aware of the significance and heightened symbolism attached to these small pieces of metal. By Vail highlighting these symbols she makes us fully aware that on the one hand they are inanimate objects devoid of emotion, whilst on the other they are personal artefacts as well as significant symbols of our shared human culture. 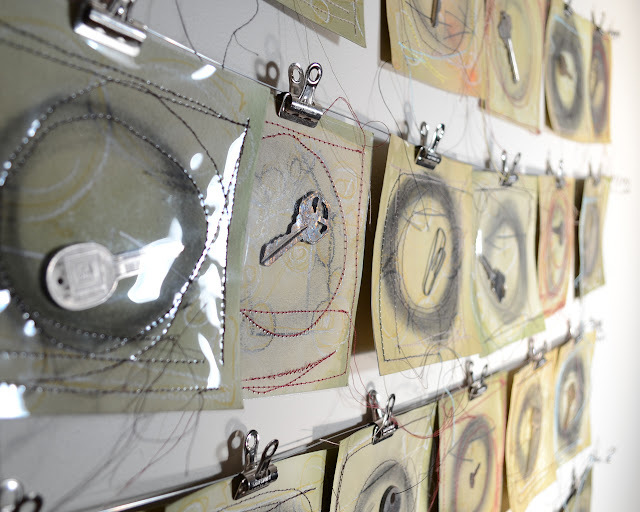 The idea of placing a selection of keys together on a wall, whilst also separating them by the use of small individual sheets as well as the significance of drawn and sewn lines, the sewn lines being used to enclose the individual keys in acetate, thus cutting each individual statement from another, gives the impression that whilst we all share both the symbolism and the experience, we are also, as individuals, alone. On another level Vail also sees the key as a form of opportunity, whether potential or lost. In fact, the name of this particular piece of artwork highlighted in this article: Gained (LOST) Opportunity gives us a good indication of where this theme can go. It is fascinating to consider the heightened symbolism, belief and potential that can be imbued into a simple mechanical format. However, it is perhaps not the key itself that takes on this burden of the potential for opportunity, whether real or not, as well as that of memory, experience and emotion, but that of the individual. We are a transient and short-lived species with little to seriously project beyond our lifespans, of the experiences we have had and the dreams we left unfulfilled. So in some respects, this particular piece of work by Vail could be seen as poignant, a look at the endless layers and the endless journey of successive lives and memories, pinpointed in an everyday object. Although in many cases symbolism, and specifically that of a personal kind, is the only real tangible idea that we can leave behind us, that personal symbolism also fades in time. However, perhaps that is not as important in the long run as we would believe it to be. In some respects, Vail's work shows us through the use of random and therefore unnamed and unidentified keys, the strength and enduring path of recollection and it is a tribute to the memory of remembrance to that of the individual but also to that of the many. We are a product of layers of humanity, a symbol, in our own right, of the hopes and opportunities, whether realised or lost, of the many individuals that came before us, just as we are to be the same for future generations. We are all keys of opportunity, of memory and of experience, we open the door for future versions of our species and therefore Vail's Gained (LOST) Opportunity is both literal and metaphoric, a description of the human condition and the cycle of life, opportunity and death that we all experience as both individuals and as a species. Andrea Vail is a well-known and admired visual artist with a wealth of experience within the fine art world. She has exhibited widely and has her own fully comprehensive website which can be found here. The website contains many more examples of her intriguing and thought-provoking work. All images were used with the permission of the artist and are therefore copyrighted. This is a wonderful post. I like your way of summing up the work as literal and metaphoric. Keys are fascinating objects of potential present, past, future. Thanks very much for your comment, it is much appreciated. As you say, everyday objects such as a key can be imbued with all sorts of connotations ranging from hope to fear, gain to loss. this was really helpful for my textiles coursework and artist research. I found it so inspireing how one object could have so many other hidden meanings. Are there any other artist that would link to the theme of decaying memories for further research that you could think of? I can't think of another artist at the moment. Andrea Vail is such a one off that it's difficult to know who else is out there that could be similar.